What Went Through Matt Lauer’s Mind When He Asked These Questions? RUSH: You just wonder what they think. ‘Cause you know when they’re doing a story on like an O’Reilly or any other Republican or conservative, in their minds, they love it! They love reporting on it. They love the raised eyebrows. They love doing it. But when it’s one of their own, what is really going through their minds? We’ll never know, because we never know. But I would still like to. So Little Brian says they all knew, and it’s true. The New York Times is working on a story — and apparently, folks, the worst is out there and is known and it is only a matter of time before it drops. But no detail on what the worst is. Let’s go through some flashbacks here with Matt Lauer. Here he is back on October 14th, 2016, interviewing the vice presidential nominee, Mike Pence, about the Access Hollywood tape of then-host Billy Bush and “real estate mogul” (chuckling), as he was called then, Donald Trump. LAUER: One week ago today, we heard Donald Trump in his own words brag about making unwanted (sic) sexual advances on women, and now we have six women who’ve come forward saying, in fact, that was more than bragging. He did those things to them. You’ve heard what they’ve had to say. You — you’ve read it. Do you believe these women? RUSH: Okay, we don’t have the Pence answer. We just doing flashbacks ’cause we’re asking, “What’s going through Matt Lauer’s head as he’s asking the question?” No, seriously! If you’re in the situation, if you have done (chuckles) what you are asking somebody about in an accusatory way, what goes through your mind? Here is Matt Lauer. This is the announcement that Billy Bush was not good enough person to appear on the Today show, ’cause Billy Bush hosted Trump on that Access Hollywood video. Billy Bush was supposed then come to the Today show but they put the kibosh on that. LAUER: NBC News announced last night that Billy Bush would be leaving the Today show be effective immediately noting that he was a valued colleague and longtime member of the broader NBC family. A statement Billy released separately last night read in part, “I look forward to what lies in ahead.” And, of course, all of us here at Today wish Billy the very best. RUSH: “And we hope he keeps quite about what he knows about us.” I mean, really, you gotta report on this stuff knowing full well? Here is Matt Lauer grilling Bill O’Reilly. LAUER: You were probably the last guy in the world that they wanted to fire, because you were the guy that the ratings and the revenues were built on. You carried that network on your shoulders for a lot of years. So doesn’t it seem safe to assume that the people at Fox News were given a piece of information or given some evidence that simply made it impossible for you to stay on at Fox News? What goes through his mind when he asks these questions? “We got you, Bill, we got you, you might have been the thing Fox was built on. We got you. And I’ve been doing everything you’ve been doing, Bill, and I’m still here, ha-ha-ha-ha-ha-ha.” But not now. I’m sorry, folks, I’m not apologizing. This is what I wonder about. We have any more of these? Yes, we do. 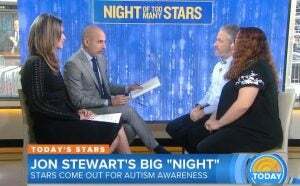 Matt Lauer asking Jon Stewart about Louis C.K..
LAUER: Your good friend and colleague, Louis C.K., has been accused of and has admitted to some lewd acts involving women. What was the impact on you when you heard not only the accusations, but his admission? RUSH: And what will you think, Jon, about me when it is revealed what I’ve been doing which makes what Louis C.K. did a piker? How do you do this? Can you imagine being a bank robber and asking a guy that just got caught, and nobody knows you’ve ever robbed banks and you’ve gotten away with it, and you have to sit there and ask these reprobates, they got caught doing what you’re doing.